The 1098 (1100) engine has had a lot of bad press over the years - largely because of early experiences when trying to tune the motor brought about problems with the then standard components available - they simply were not up to taking any real punishment as experienced in racing. This fallacy was handed down generation to generation like some scary bedtime story. Those that have used the unit in more recent years, employing more capable componentry know what a demon motor this can be. Following is an initial look at what it will do with a little modification - the results compared directly with it's smaller brother the 998 for illustration of the potential. When the Mini was first conceived it ustilised a de-stroked version of the then quite remarkable 948cc A-series engine. The 948 was itself a development of the very first A-series engine used initially to power the A30 in 1952 and the redoubtable Morris Minor in 1953 - an 803cc job (2.28-in/57.91mm bore, 3.0-in/76.2mm stroke giving a bore to stroke/stroke ratio of 1.316) designed in the philosophy at that time of long-stroke, high torque engines needed to haul the tank-like structures, called cars back then, around. Rpm for power wasn't in sight. In the good (?) tradition of vehicle manufacturers, tooling costs featured prominently in evolution of the species; so when a re-think on the rather wimpy and feeble 803 was conducted in 1957, they simply increased the bore size and beefed up the bottom end components - a nod in the direction of the flowering idea that small bores limit breathing capability and therefore valve sizes. Both restricting rpm potential - and consequently POWER. Not that the 948 was a fire-breathing monster with its new 2.477-in/62.92mm bore and slightly improved bore/stroke ratio of 1.211, but it was a start and an appreciable improvement power-wise. More importantly, it was more tunable. The 803 would wilt at the thought of any decent modifications for power, the 948 was a trooper! Willing to run easily to 6,500rpm (steady now!) it attracted a host of tuners - some inexorably drawn into the character-full A-series engine big time. The likes of Alexander Engineering, Speedwell, Downton, and of course the irrepressible John Cooper who was carving swathes through the field of Formula Junior (yester-year's Formula 3000). We owe those folk a very great deal. Especially as it spawned the Mini Cooper legend, starting with the 997cc version. Remembering the comment re manufacturers and their production/tooling costs - the increase in engine size didn't follow the short stroke/big bore angle being whole-heartedly investigated by Ford at that time. No, they simply re-stroked the 948 to 3.2-in/81.28mm and reduced the bore a tad to 2.457-in/62.43mm - giving a bore/stroke ratio almost as bad as the 803 had at 1.302. Difficult to comprehend as it was clearly a step backwards, but then this shortsightedness was the downfall of the whole British motor industry. Didn't stop the car being embarrassingly quick though as it was in a very compact, nimble little car - the increase in torque and power doing it's job admirably. Jumping forward a little, The 997 gave way to the far better and more efficient 998 series. The increase in bore and reduction in stroke to what the 948 was originally (2.543-in/64.59mm, 3.0-in/76.2mm respectively) gave a healthier 1.179 bore/stroke ratio - the reason why it revs so freely without doing itself an injury. Especially when a more efficient head with bigger valves on it was used as in the case of the Cooper. The introduction of the Austin 1100/1300 series saw vehicle weight rise, and minds turned to increasing torque out-put of the currently available engines. It wasn't long before a decision was made to simply re-stroke the 998 in an attempt to duplicate the 997 successes. Thus the 1098 (1100) was born by stretching crank stroke to 3.30-in/83.82mm. All this entailed was a new crank and suitably shortened piston set - everything else was the same. Although concession was made by evolving a more efficient cylinder head with bigger inlet valves. Simple. I've ignored all the different power figures for the multitude of variants thus far on purpose - they're simply not relevant. The relevant figures are those directly comparable for the mission of comparing the improvements made between the 998 and 1098. The 998 in low compression guise (8.9:1) gave an OE recorded out-put at the crankshaft of 38bhp @ 5250rpm, and 52lb ft torque at 2700rpm. By comparison the 1098 gave 45bhp @ 5250rpm and 56lb ft @ 2,700rpm. That's 26.5% more than the 998 AND it had an even lower compression ratio of a measly 8.3:1! Not only that, but the figures written down don't show the actual over-all torque curve that makes the 1098 engine a much nicer road-orientated engine as it pulls well from almost anywhere in the rev range. How? Surely it wasn't simply the stroke increase and head up-grade? You're right - it wasn't. Much of this was down to the camshaft. The increase in duration was a definite step forward. In fact the camshaft proved so impressive that the profile was employed in the first production Cooper Ss. Through countless rolling road sessions by the multitudes, we know we can expect a reasonable 20% bhp and 12% torque gain simply by bolting on a quality stage one kit - so that's an extra 9bhp and 6.7lb ft giving 54bhp and 62.7lb ft torque at the crankshaft. Pretty much what the Cooper 998 variant was achieving bhp-wise, but loads more torque. Definitely something to build on then. What I was looking to achieve was a usable, non-stressed, but substantial performance gain without a wallet-shrinking budget. To wheel out that golden nugget of mine - 'tuning should be a compromise of what's possible and what's necessary'. Applying this will ensure the former stated goal and also be directly comparable to the 998 engine tuning covered in the relevant articles. Incomparable data and testing is a complete waste of time as it means/proves little when the question 'but how much better is it than what I have now?' is posed. To ensure the test was as comparable as possible, a similar set of rules was used as in tuning the 998 to avoid a car that is exciting for the first few miles, but a pain thereafter, maintain some semblance of reasonable mpg, and not have the engine go 'pop' the first time the pedal's firmly pressed to the metal. For this test I had to re-build an old engine. Simply because I don't have a super-low mileage engine to work with like when I did the 998 test. However, no 'trickery' was used to enhance power out-put. This test had to be as comparable as possible to that which you folk can easily achieve. The only concession here was to the pistons. The only pistons now available in the UK for the 1098 are the low-compression types. Although a reasonable road-use piston, they are not suitable for constant high rpm use. Since this engine will be seeing duty as daily transport and weekend warrior at Harewood hill-climb sometime after the test, I wanted to make sure the pistons were going to live a long and healthy life. To this end I employed the services of a couple of my 'foreign friends' over in Australia. They sourced and sent me a couple of sets of the Hypatec pistons available over there - somewhat stronger than the AE ones available here. Thanks Jacob, and especially Kevin - who posted them over. They did not influence this test at all as the compression ratio has been deliberately kept at 8.9:1 to ensure as direct a comparison as possible. I'll do the blueprinting now this test is completed. The gearbox used was a straightforward, standard A-plus ratio-ed item with a 3.44 final drive, centre-oil pick-up, and competition diff pin from Mini Spares Centre. Again, a nod in the direction of spirited use the flywheel assembly is the old three-piece, pre-Verto type. It did not influence the test in any way. And to continue the 'totally comparable I decided to stick it in the front of my old nail - the one I did the 998 test in - thus exactly duplicating the running conditions as far as possible. Minimal cost for maximum gain is the name of the game. The parts I decided to alter slightly were the camshaft and rockers. I've been itching to get some real data on how the Swiftune Racing (01233 850843) SW5 cam performs in something other than a 1380. Comparing the profile data using standard sintered rockers against the 997 Cooper cam with 1.3 ratio rockers gave fairly similar results. I can't give exact data on what the special SW5 cam is - well I could but then I'd have to kill you, and to be honest I simply don't have the time for 165,000+ assassinations right now! Anyway, as the match was so close it was a good chance to see what this cam did in a small-bore unit, and thought the 1100's characteristics would be able to deal with the slightly sportier profile. This whole cams/rockers decision was based around the problems that higher-ratio rockers can cause with various sportier cam profiles in certain engine sizes/build specifications. The crucial point is at overlap; at best it re-arranges where the engine performs or at worst it can kill an engine's prospective whole power/torque out-put. Unlike the 998, the 1100 is a little fussier on the ignition advance curve side of things so I contacted those illustrious folk at Aldon Automotive (01384 572553) to brew me up something a little different. I gave them some suggested criteria to work to, as I had planned on doing the dizzy myself - but 'the best laid plans of mice and men' and all that…Aldon's 'dizzy-master' built me a dizzy along the suggested lines and a little of his own magic - and it works perfectly! It isn't a great deal different to the Aldon 'Yellow' spec dizzy, so one of these would function admirably. I'm also running one of the excellent Aldon/Petronix Ignitor electronic ignitions. Having used these almost incessantly since their inception they never cease to amaze me where performance against cost is concerned. I've long since become blasé with how easy they are to fit. So the camshaft, rockers and distributor were the only difference to that if the 998 test. Same spec Mini Spares Centre-derived cylinder head, same compression ratio, same induction and exhaust, same gearbox and final drive. Same car even. I swopped the motors over, using the same carb, exhaust, etc. from the 998 test - even down to the carb needle. A little contemplation revealed that it wouldn't be too far out. In fact from previous 1100 experiences they seem to end up a slightly leaner needle compared to a directly similar 998. This time, instead of doing the standard head and rockers thing to start off with, I'm doing the Full Monty from the off. I already know what a standard 1098 is capable of. We have relative and accurate data on what the various changes made on the 998. Passed experience has proven the data collected when applying up-rated equipment to a given power unit on GRV's rollers in stages is accurate enough to make meaningful percentage-based comparisons. Plus it keeps the costs down on this development work. What? You thought I was accruing all this limitless expense out of the goodness of my heart and for your delectation! You're mad. Once again I visited the excellent GRV (01706 377410) rolling road at Littleborough, Lancs. This maintained the comparative test idiom, and ensured the engine was set up perfectly by the venerable Andrew Preston. For further information and comparative data, I popped down to see my good buddies Peter Baldwin at Wilshire's Garage in New Whimpole, Cambridgeshire (01223 207217) and Michael Barratt of MBE in Lincoln (01522 545189). Sticking it on their individual rollers after set-up at GRV will give those of you obsessed with rolling road comparative figures something to work on. After having the 1100 engine set-up on GRV's rollers I then zoomed down to M.B.E., and then down to Peter Baldwin's at Wilshire's Garage. I picked the other two as they are well used by many a Mini owner, and are within reasonable striking distance of my home in the wilds of North Yorkshire. Least of all because they're both good mates of mine. The result was M.B.E. 's gave exactly the same as GRV's (54bhp at the wheels) and Peter Baldwin's gave 70bhp. I haven't said 'at the wheels' here because Peter has had his machine set up by legendary UK Sun Rolling Road expert (now retired) Peter Last to read near crankshaft outputs. Hence the reason why Peter's figures are always higher than most other rolling roads give. He admits it isn't 100% accurate on all cars - but reasonably so on engines up to 180bhp. The smaller the engine/lower the output, the more accurate it is. And on my Mini - 14bhp loss through the drive train is about spot on. And this week's wining numbers are…astounding. KC1100 (graph 'A') - Re-built 1098cc engine, standard apart from Swiftune Racing SW5 camshaft, stage three cylinder head and stage one kit. 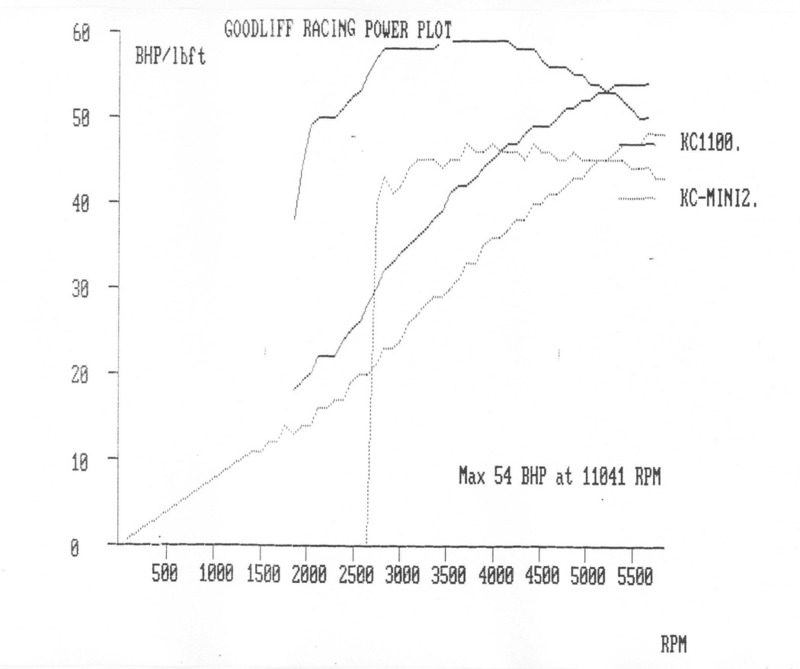 KC-MINI (graph 'B') - Standard 998 engine with 997 Cooper profile camshaft, same stage three cylinder head as KC1100, 1.3 roller-tip rockers and stage one kit over-laid on KC1100 graph. Taking graph 'A' on it's own, the results look quite impressive, considering it's a 40+year-old design engine with some relatively minor modifications. Peak power out-put is 54bhp at 5,741rpm at the wheels, pulling strongly from way down at 1,500rpm with a slightly up-ward bulging curve all the way. Nice. But just look at that torque! Torque is what accelerates the car - and this has plenty of it in exactly the right place. When motoring generally the engine is usually working in the 2,000-4,500rpm bracket. This little baby is producing prodigious amounts of torque throughout the whole of this range - starting with very nearly 50lb ft at 2,000rpm, peaking with 59lb ft between 3,500rpm and 4,100rpm, but hanging on with 50lb ft at 5,500rpm. Monster. And there may have been a couple more horses, but Andrew didn't feel too comfortable about running this near-standard motor up to 6,500rpm just for the fun of it. After all, it's a long walk home from there to home! 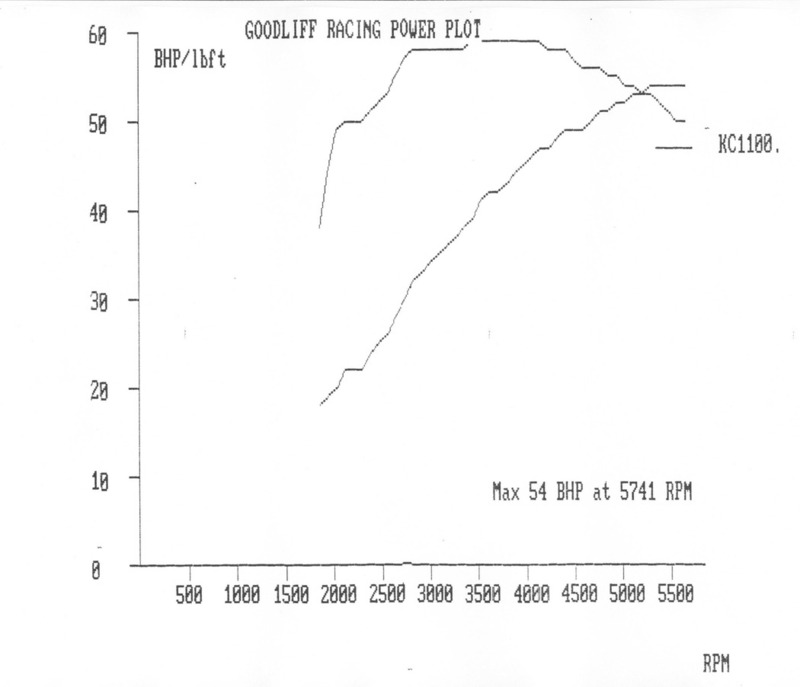 Over-laying it onto the previous 998 engine test results (graph 'B') the true picture really shines through. The 998 was good - but the 1100 is stupendous. It makes an average of 7.5bhp (10bhp in most places) more than the 998 all the way up, and a huge 13+lb ft torque! As with the 998 - we both decided messing with the cam timing wasn't worth the effort in view of the results. Ignition setting was 6.2 degrees at 1,000rpm, no vac advance, 15.4 degrees at 1,000rpm with vac advance connected. Nice one Aldon. All this and it's still on a standard air cleaner case. What this doesn't show is how incredibly emissions-efficient this set-up is. At idle with 3.5% CO showing, the hydrocarbons were a mere 380! Now that IS unusual in a tuned 'ancient' engine. And just to prove how repeatably accurate this rolling road is - it even reproduces the 'weirdism' that is the vertical line at the start of the 998 torque test results. On the last test on the 998s - it was KC-MINI1 that had the line. That's a stonking 50% bhp increase and 35% torque increase. That's the effect the SW5 cam has. The modified 998 went very well, but you had to work it to get the best from it. That means revving it a little harder most of the time. The 3.44FD was just a shade too high with the standard A+ gear set. But then again a 3.15 would have been just a bit too much considering how it needed to be buzzed to keep it active. The 1100, on the other hand, just pulled. From anywhere in the rev-range. It swallowed gears faster than the 998. Interestingly, and another 'bonus' of a rolling road visit, is being able to check actual road speeds against rpm. The 998 achieved a 'real' 70mph at 4,40rpm, where the 1100 managed the same speed at a lower 4,300rpm. You'd think they'd make the same rpm to achieve the same speed considering the gearbox ratios were identical. Just further illustration that the 1100 doesn't have to work so hard to achieve the same speeds. The speedo was reading 74mph at this point. Not bad considering I set out to match the FD with the speedo using available speedo drive pinion and spindles. This gives 16.28mph per 1,000rpm. Even more interesting is comparing this with the calculus I presented way back in the September 1998 issue when discussing final drives and how to sort what speeds you get with different wheel/tyre combinations with some accuracy. After all - there are loads of proffered methods for this. My method described there works out on paper to 16.46mph per 1,000rpm. Now that's impressively close! Far from being the 'non-revving, boring, slug motor' the 1100 has been drubbed with, it's a very capable engine that gives exceptional results for little cash input. It would quite easily pull a 3.1FD without loosing the performance results here. In fact it would probably enhance it, allowing further distances to be covered in all gears with a more relaxed cruising speed. Further - what I think it REALLY needs is a Mini Spares Centre 'Clubman' close-ratio straight-cut gear kit and 3.1FD to see what it can do! During the rolling-road session, the needle choice proved to be very close, although a little on the rich side - particularly on full load. After some discussion with Andrew on this, we decided to leave the needle as was (AAA) and adjust the idle mixture up a little to drop the CO at idle from the 5.4% it was reading to 3.5%; thus raising the jet and theoretically leaning the mixture out across the whole range. The merest hint of adjustment brought about a massive change in CO reading! Removing the dashpot, Andrew revealed the jet was all but flush with the bridge. This affects the way the carb performs quite drastically - generally caused by a worn jet. This would also go some way to explaining the slight over-richness everywhere. A new jet would possibly get things into a better position and improve the fuelling. Despite all this, the mpg is pretty good. Thrashing the thing mercilessly back from GRV, it returned 35.2mpg. More sedate urban driving and general duty use has raised this to a very respectable 43.6mpg! The 'motorway' run result is very similar to that gleaned from the 998, the urban use is far better. Further testament perhaps to the slightly less 'busy' nature of the 1100. And this would improve again with a fresh jet. The SW5 cam is a blinder. Buy it and use it in anything road going - you won't be disappointed. It gives - without doubt - the best performance increase throughout the usable rpm range without causing emissions problems. In fact it gives better emissions than most standard, un-tuned, carbed engines I've come across! It has become my first choice road-cam over the 997 Cooper one I've used for so long. NOTE: The engine components used in this article apply to all in-line engines also (948/1098/etc. ).